What is the role of the media in promoting peace – without taking sides in a conflict? Martti Ahtisaari, Kofi Annan and Mary Robinson discussed this question at last week's Elders debate in Oxford. How should the international community promote universal human rights, while respecting cultural differences? Hina Jilani and Mary Robinson discussed this question during the Elders debate in Oxford last week. The Elders discuss what they mean by 'speaking truth to power’, and how their status as Elders allows them to – as Jimmy Carter put it – “go where we please, meet with whom we choose, and say what we believe." Kofi Annan: "We cannot keep consuming as if there's no tomorrow"
At an Elders debate in Oxford last week, Kofi Annan and Mary Robinson respond to questions about climate change and urge young people to mobilise ahead of a major climate conference in Paris in 2015. G7: where are the women leaders? Debate highlights: how do you speak truth to power? The Elders will discuss a range of issues – from conflict and sectarianism to good governance and women’s role in peacebuilding – at a debate this week in Oxford, UK. Find out how you can follow the event and send in your questions for the Elders. CEO of The Elders Lesley-Anne Knight presents our 2013 Annual Report, a review of our challenges and achievements during a year of transition for the organisation. The US-led Middle East peace talks were suspended on 29 April. 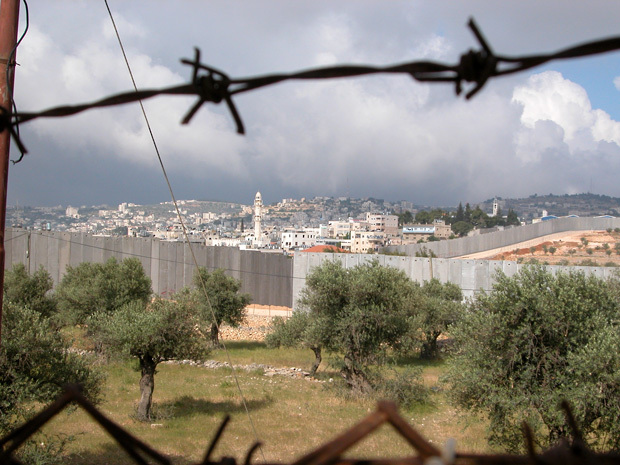 Writing in The Washington Post, Jimmy Carter argues that reconciliation between Palestinian factions could provide an opportunity for a new round of negotiations. Naw K’nyaw Paw, Secretary of the Karen Women’s Organization, describes her work to empower women and explains the Karen people’s decades-long struggle for equality in Myanmar. 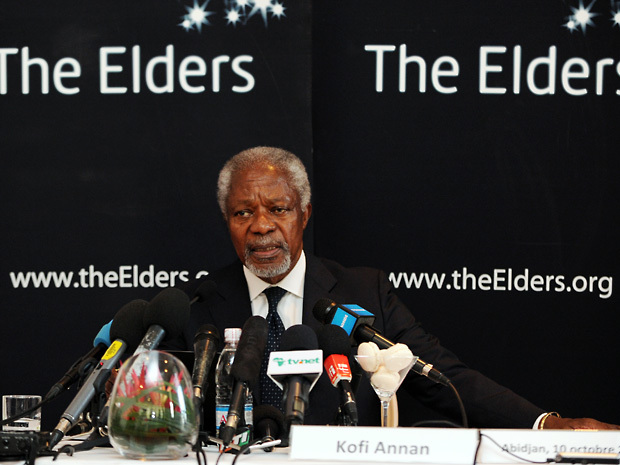 Kofi Annan: Russia, US and EU should make common cause to defuse the Ukraine crisis The Elders call for a peaceful resolution through dialogue. "We hope we have adequately reflected the views expressed by many people to The Elders regarding the continuing challenges faced by the Myanmar people." The Elders' CEO Lesley-Anne Knight introduces the report from The Elders’ recent visit to Myanmar. Kofi Annan: These rulings do not meet accepted international standards and could provoke further unrest in Egypt After more than 600 people were sentenced to death on Monday, The Elders appeal for a fair, transparent judicial process in Egypt. كوفي عنان يقول: "أي سلام دائم مع إسرائيل سيتطلب اتفاقية سلام مع حكومة فلسطينية ديمقراطية موحدة تمارس سلطتها في الضفة الغربية وقطاع غزة معا." Qui prendra les rênes de la lutte contre le changement climatique ? Climate change: who will lead? How can we make sure world leaders take the bold action needed to tackle climate change – and what can young people do to spark political momentum? Join the discussion with The Elders, students and climate activists next Tuesday. “My Elders colleagues and I have had a chance to ask ourselves what wisdom our own lives, and careers, may offer others.” Jimmy Carter A series of Elders interviews with Japanese journalist Mayumi Yoshinari has been published today in book form. How can Myanmar's peace process become more inclusive – and what can the international community do to help? Martti Ahtisaari and Gro Harlem Brundtland speak to Nyein Nyein and Lin Thant from The Irrawaddy. Gro Harlem Brundtland and Martti Ahtisaari will spend five days in Myanmar and Thailand. With Myanmar opening up politically and economically, The Elders aim to promote inclusive governance and socio-economic justice. “Europe must not lose sight of the tragedy unfolding in the Central African Republic” – Kofi Annan The Elders call on European leaders to fulfil their pledge to help protect civilians and halt violent clashes in the CAR. The Syria conflict has killed more than 140,000 people. As the crisis enters its fourth year, campaigners worldwide are mobilising public pressure to push for an end to the bloodshed. Desmond Tutu and Jimmy Carter spent an hour responding to questions on women’s rights yesterday, in The Elders’ first ever live Twitter Q&A for International Women’s Day 2014. To mark International Women’s Day 2014, Jimmy Carter, Hina Jilani and Desmond Tutu will answer questions in The Elders’ first ever live Twitter chat. “The use of force and any further loss of life should be avoided at all costs.” Kofi Annan The Elders express deep concern at the crisis in Ukraine and urge all parties to resolve their differences peacefully. "The Elders will closely follow whether, and how, these promising words are put into action." Lesley-Anne Knight, CEO of The Elders, welcomes Saturday's diplomatic breakthrough on Syria at the UN Security Council. Elders in Iran: "we must rebuild trust and mutual respect"
At the start of The Elders' three-day visit to Iran, Kofi Annan speaks to journalists following a meeting with Iranian Foreign Minister Javad Zarif. 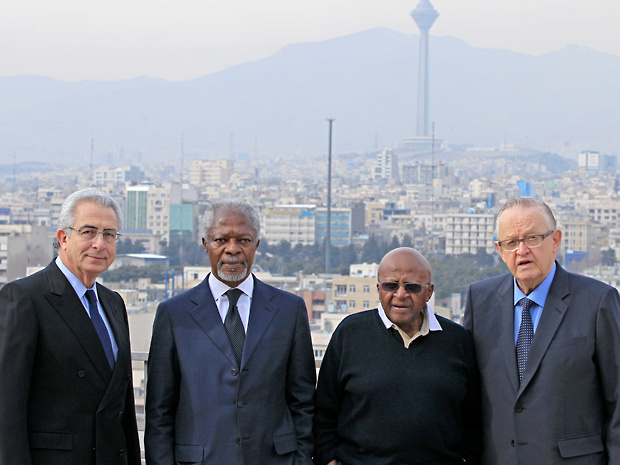 Kofi Annan, Martti Ahtisaari, Desmond Tutu and Ernesto Zedillo travel to Tehran to discuss Iran's relations with the international community. "No one can win this war." Writing in The Washington Post, Jimmy Carter and Carter Center Senior Advisor Robert A Pastor suggest three alternative preconditions that could bring Syria's warring parties to the negotiating table. Can 2014 be a turning point for Syria? “Humanitarian access must be an urgent priority at Geneva II.” Lesley-Anne Knight, CEO of The Elders, urges the international community to ensure January’s peace conference in Geneva delivers meaningful decisions for the embattled people of Syria. “The constitution should protect the diversity and cultural heritage of Egypt” – Kofi Annan The Elders encourage Egypt's government to enshrine the rights and obligations of every citizen in the fundamental laws of the nation. Climate crisis: who will act? “If governments are unwilling to lead when leadership is required, people must.” Writing in The New York Times, Kofi Annan warns that a failure of leadership on climate change would be catastrophic. Global drugs policy – time for a smarter approach? A first step to peace in eastern DRC? Mary Robinson and fellow international envoys welcome the end of hostilities between the M23 rebel group and the government of the Democratic Republic of Congo. Kofi Annan calls for swift progress and an early resolution of the crisis Ahead of the next round of talks on the Iranian nuclear programme, The Elders urge all parties to seize this historic opportunity to move towards a deal. Who will lead Syria out of crisis?